The statements in the following sections will give you ideas for similar challenges you can set for your class. For each one, ask the children to follow the process similar to the one outlined below to prove or disprove the statement. They can work in groups on different statements and share their results at the end of the lesson. Take the following statement as an example. Children are required to identify, collect and analyse data that can be used to test the validity of the statement. In the football Premier league, teams get 3 points for a win, 2 for a draw and 1 point for losing. Lots of children will probably know that this statement is incorrect, but what sort of evidence would they be able to provide in support of their viewpoint? Would they use the ‘Everyone knows that’s not right!’ or ‘Because my mum told me!’ approaches, or would they be able to use data in support of their argument? Would they know where to find the data? Would they know how to read it and be able to select the data that’s required to support their case? 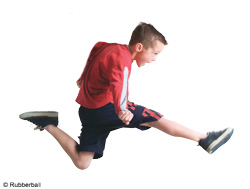 It’s impossible to do a standing long jump that measures more than two-thirds of your own height.